Mag, a 66 year old lifelong mid-pack athlete, found her true athletic passion twenty years ago when she discovered rowing. She started with Whaleboats and La Sirenas in the Oakland Estuary, but quickly moved to skinny boats which she now rows with her team in Marin. She found rowing to be addictive in all its complexities - the technical aspects of the stroke, the need for synchronization between rowers, and the rigors of training. Since rowing is a sport that requires use of all body parts, any injury comes with a timeout. But when Mag suffered a spiral break in her femur (while bowling - how silly is that? ), things looked pretty grim. After surgery to insert a titanium rod in her left femur and weeks of dealing with a walker and then a cane, Mag started rehab at Ultrahealth. All she wanted was to be able to walk again, unaided by a cane or walker; but her therapist, Marty, encouraged Mag to set her goals a little higher. It wasn't easy and there were tears from pain and frustration, but the team at Ultrahealth never let Mag lose sight of the possibility of going beyond "just walking". 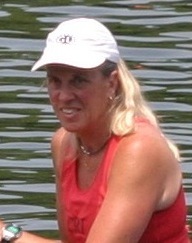 Within a year Mag was back with her rowing team, competing at Nationals. "There were many times I was frustrated and wanted to quit therapy but the pull to get back in a boat was incredibly strong. The Ultrahealth team pushed me and helped me make it happen."